"Mama, can we go to Target?" Senia Mae asks as we pull out of the elementary school's parent pick up. "What do you need there?" "Some Valentine's decorations for my American Girl dollhouse. You know my girls need to be ready." "Of course they do," I say with sarcasm, "Um, Target is twenty minutes away. How about if we run through Walmart real quick? We are low on milk and we also need to pick up some cat food." "OK, Mama," she says, sitting happily in the back seat. We enter Walmart not on the grocery side but through the retail door because the "seasonal" promotions and pet sections are equally close. "Mama, look at THOSE costumes," Senia Mae excitedly shouts as she points to the rack that held the children's Halloween costumes a few months before. "Ahhh, those aren't really costumes," I say nervously as two other women overhear our conversation and choke back laughter. Walmart O Walmart... how I love thee. 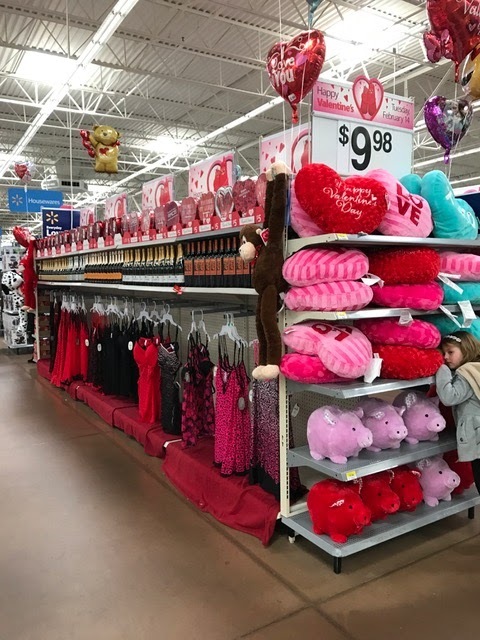 When I'm in my mad dash to get my list completed in thirty minutes, you provide everything I require in a quick one stop shop: groceries, first-aid, lawn care, arts and crafts, and now even chintzy Valentine's lingerie! Watch out Frederick's of Hollywood!